These competitive races have attracted the greatest amount of outside spending and reveal significant trends in the influence of money in politics. As part of a series of analyses of outside spending in the 2014 midterm elections, the Brennan Center examined independent expenditures reported to the FEC in the nine most competitive senate contests. * These competitive races have attracted the greatest amount of outside spending and reveal significant trends in the influence of money in politics. We will release a more detailed report later this month; this analysis conveys some preliminary findings. 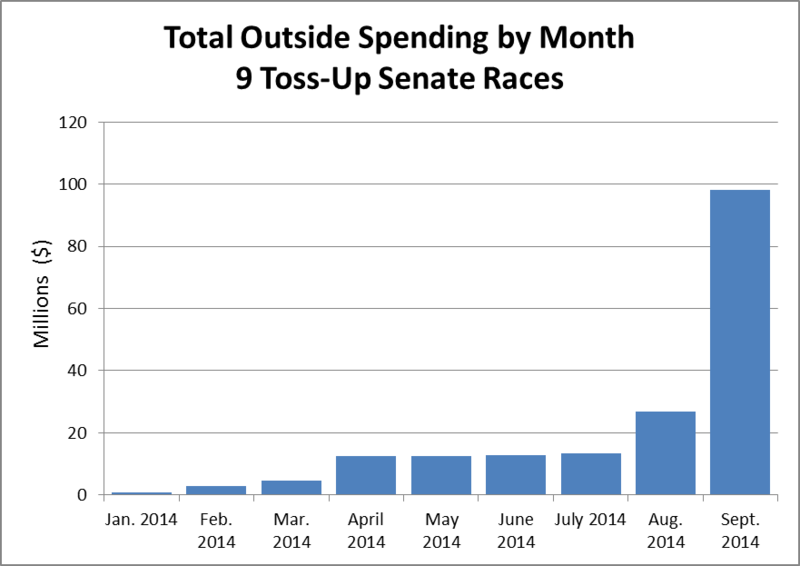 Massive sums have been spent in these nine competitive senate races. As a comparison, in the last midterms in 2010, nonparty outside spending in all senate races reached only $97 million for 37 contests. As with all analyses of FEC data, these totals do not include spending on ads that are not required to be reported to the FEC because they don’t explicitly call for a vote and are not aired close to an election. 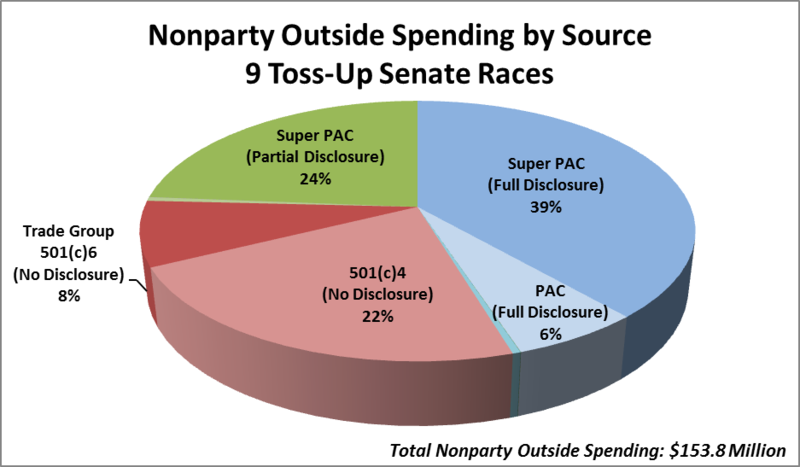 Dark money is spending by groups that hide the identities of some or all of their donors. 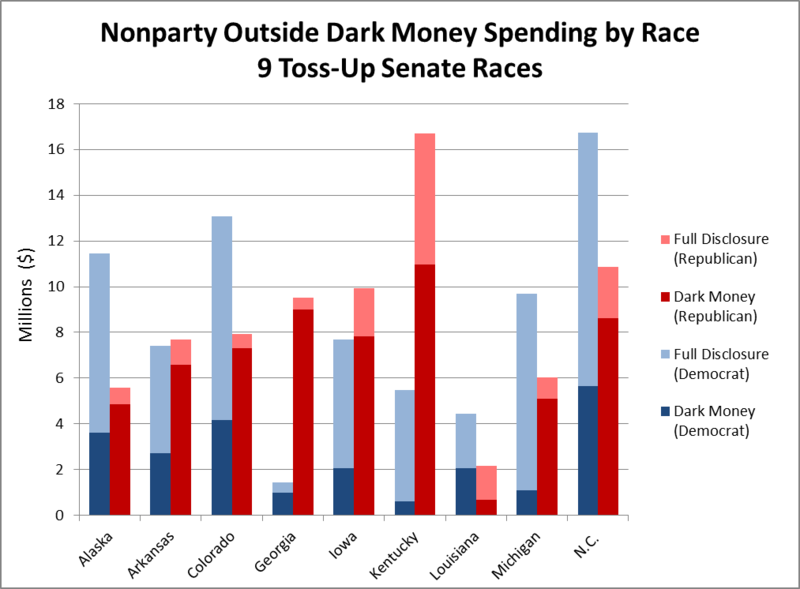 There was $84 million in dark money spent in our nine races more than a month before Election Day, already approaching the $97 million in dark money that was spent across all 33 senate elections in 2012. Our totals don’t include tens of millions in unreported spending, all of it dark, meaning that the true portion of dark money is much higher than 55 percent. Overall, 80 percent of pro-Republican independent expenditures came from dark money groups, compared to 30 percent of outside spending favoring Democrats. In addition, unreported spending – where the heavyweights are conservative groups like Americans for Prosperity and Crossroads – leans Republican, meaning the 80 percent figure underestimates the true extent of the preference for secrecy among GOP supporters. The most active dark money group (and 4th-biggest spender overall) in our sample is the U.S. Chamber of Commerce, a nonprofit trade organization that does not disclose its donors. The Chamber, with $12.4 million in expenditures in these nine contests, was outspent only by the two national party committees and the Democrat-aligned Senate Majority PAC. Senate Majority Leader Mitch McConnell has attracted the most dark dollars, with the lion’s share – $7.6 million – spent by a nonprofit group devoted entirely to attacking his opponent, Alison Lundergan Grimes. None of the Democrats in our sample faced a competitive primary, yet primary expenditures by outside groups favoring Democrats totaled $24 million, 84 percent of which was spent attacking Republicans. Pro-Democrat groups spent the most on cross-party primary attacks in Alaska and North Carolina, where incumbent Democrats got to wait out competitive Republican primaries, and in Louisiana, where the open primary system forces candidates from opposing parties to face each other for the whole election cycle. On the other side of the aisle, pro-Republican outside spending in the primaries came to $11 million, with only 17 percent attacking Democrats. September alone saw $98 million in independent expenditures – more than half of all reported outside spending so far in the cycle. This reflects increased attention to the approaching election as well as the entry of the parties into races after primaries conclude. Party committees have spent $35.7 million in our nine races, virtually all of it since the beginning of August. The sharp upward trend indicates that the true extent of outside spending in 2014 is yet to be seen. *We examined FEC data, as collected by the Sunlight Foundation, concerning independent expenditures through September 30. We selected races listed as “toss-ups” by the Cook Political Report: Alaska, Arkansas, Colorado, Georgia, Iowa, Kentucky, Louisiana, Michigan, and North Carolina. Although Kansas also appears on Cook’s list, we excluded it. Kansas became competitive just this September when the Democrats succeeded in removing their candidate from the ballot to set up a head-to-head contest between the incumbent Republican and an independent. In an upcoming report, we will provide a separate analysis of spending in Kansas during the period it has been competitive.